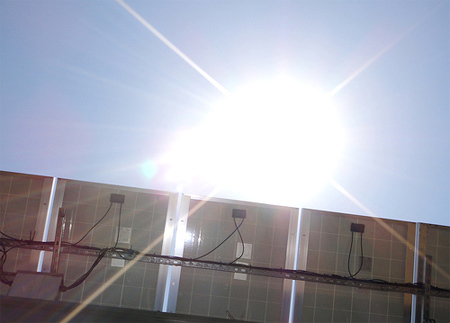 The two most frequently used types of solar energy are photovoltaics and solar thermal power. Solar power is the process of converting sunlight into electricity, using one of several methods. Photovoltaics can covert the light from the sun into an electric current using what is known as the photoelectric effect. A solar panel system, uses photovoltaic cells to capture the energy from the sun. The cells do not require constant direct sunlight to function properly; even on a cloudy day, they can still generate sufficient electricity for a standard residential house. Photovoltaic cells are manufactured from a semi-conductive material which is layered; silicon is the most frequently used material for PV cell production. When the sunlight hits the cell, an electric field is created across the silicon layers. The amount of electricity produced is dependent on the strength of the sunshine. These layers of PV cells are then mounted together in panels which can be installed onto a rooftop. PV cell power is measured in what is known as ‘kilowatts peak’, or kWp. This is the rate at which the PV cell will generate electricity during its peak performance times, which are usually during the summer months. The use of solar photovoltaics has become increasingly popular in the last few years, both for domestic and industrial buildings. According to recent figures it is thought to be representative of about 0.5% of the electricity demand worldwide. Over the course of 12 months, the total output of power of the global PV capacity is equivalent to about 80 billion kWh of electricity; enough to supply enough energy to more than 20 million homes. Currently, about 100 countries are using solar PV. The second type of solar energy which has been used by more and more people over the last decade or so is the solar thermal system. This kind of power uses some of the basic principles of the behavior of heat the conversion of solar energy into thermal energy. This system uses the heat from the sun to warm the water used in domestic homes. Most people use this system in conjunction with a conventional immersion heater or boiler, in case cloudy weather prevents the system from producing enough heat energy. A thermal solar system uses either a set of panels called collectors or a set of evacuated tubes, which are installed onto the rooftop. 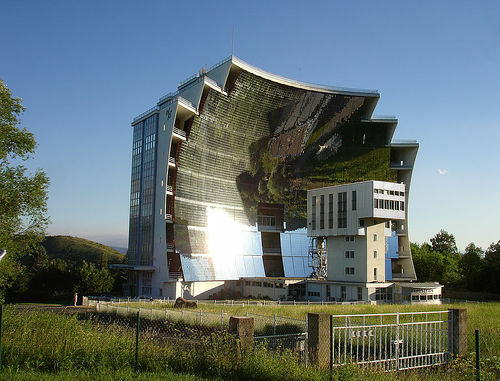 These panels then collect the sun’s heat and use that energy to heat the water stored in a cylindrical storage device. This storage device contains a series of pumps, which are used to circulate a heat-transfer fluid (usually an anti-freeze mixture) to the panels. When the heat fluid is warms up in the collectors or evacuated tubes, it is then pumped backed into the cylindrical tank, where a device called a heat exchanger then transfers the heat from the fluid to the stored water. A thermal solar system can help households to increase their carbon savings, dropping from 510kgCO2 per year when using an immersion heater to 230kgCO2 per year when using the solar system.